Wildfires also called forest fires and wildland fires, are unplanned fires that burn in a natural area, such as a prairie, grassland, or forest. They burn through acres of land quickly (think, minutes), and destroy everything in their path. In the U.S. alone, more than 100,000 wildfires burn through 4 to 5 million acres of land every year. They are most often caused by people – four out of five wildfires are started by humans – but they can be prevented by them as well. If you are in a fire-prone area, here are some tips for planning ahead and what to do if you find yourself caught in a wildfire. Taking action to prevent a wildfire can save homes and lives. If you see an unattended or out-of-control fire, contact the park service, your local fire department, or call 911. If you start a campfire, never leave it unattended. Always completely extinguish the fire before leaving the campsite or going to sleep. To do this, douse the flames with water and stir the ashes until they are cold. When camping, avoid spilling and flammable liquids when using and fueling lanterns, stoves, and heaters, and keep them stored away from appliances. Register for your community’s warning system so you can be notified of any impending danger. Know the evacuation plan in the event you will need to evacuate and create a checklist of so you know what needs to be done, even when in a panic. Also, keep your pets in mind and have a plan for them. If you are advised to evacuate, leave as soon as you can. Use the checklist you created for evacuation and gather your emergency supplies. Try to wear protective clothing and footwear to protect yourself if you encounter flying sparks or ashes. Before you leave your house, make sure to remove combustibles from your yard and shut off propane, natural gas, or oil supplies. Close all windows, doors, and vents inside to prevent a draft, and fill any large vessels with water to slow the fire. 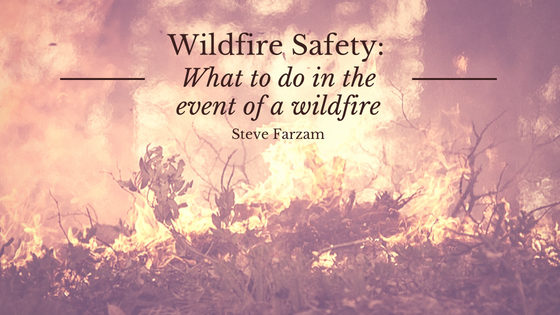 You will most likely feel yourself going into a panic, but it is crucial to remain calm if you find yourself trapped in a wildfire. If you are in a vehicle, park your car in a clear area, away from vegetation. Cover yourself with a wool blanket or jacket and lie on the floor of your car and then dial 911 from your cell phone. If you are on foot, find a clear area away from vegetation, a ditch, or depression on level ground. Lie facedown and cover your body, then call 911 from your cell phone. If you are in your home, call 911 to alert authorities of your location. Keep your family together inside the house, away from windows and doors. Keep all windows and doors closed, but unlocked and fill large vessels with water to help slow the fire.